Holley EFI 7" Dash #553-109 Compact , customization dash for use in a variety of applications 7" low glare, high brightness, high contrast, full color touch screen for easy viewing even in full sun 800x480 resolution with auto brightness and dimming . Molded ABS instrument panel for the 1969 Camaro. The Holley EFI Digital Dash is completely customizable with a variety of gauge and indicator screens that can be programmed to display any parameter you need. The dash also offers a virtual switch panel, user defined alarms, configurable shift lights and can control on screen playback of your EFI data logs. The Holley EFI Digital Dash measures 7.5″ wide, 4.625″ tall and 1″ deep which makes it a compact, customizable dash for use in a variety of motorsports applications. The Dash features a 7″ low glare, high brightness, high contrast, full color touch screen for easy viewing even in full sun, plug and play connection to all Holley EFI systems as well as a weather proof aluminum housing featuring flexible mounting options. Monitor the power of your Holley EFI system at a glance! 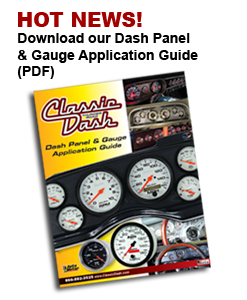 This dash is ideal for anything from a JR dragster to Sportsman racing or from a daily driver to a show winning roadster.